Could You Be the Next Julie Powell? LOS ANGELES, CA -- (Marketwire) -- 09/01/09 -- Could you be the next Julie Powell? For anyone who saw the movie "Julie & Julia," and wondered if they too could build a business doing something they loved, Success Coach Gina Ratliffe created a five-day event, "Purpose. Platform. Profits. : Manifesting and Monetizing Your Dream Life." 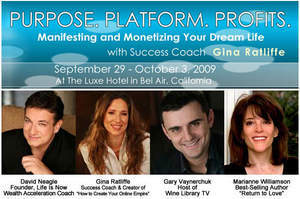 Ratliffe recruited Best-Selling Author Marianne Williamson, Wealth Acceleration Coach David Neagle, and Wine Library TV Host and Social Media Expert Gary Vaynerchuk to share their expertise on creating a profitable platform based on your passions at this event, which takes place September 29 - October 3 at the Luxe Hotel in Bel Air, California. "This event is about a new way of doing business that centers around platform building, which is where the real value is," says Ratliffe, who holds a master's degree in psychology and has taught thousands of women how to successfully build their online empires through private coaching and recorded programs. "You don't have to sell products or services any longer to make money. That can be part of your offering, but the new currency is eyeballs on Twitter or other social networking sites. To attract followers you're usually giving away free information and you're being rewarded through ad sponsorships, book deals and speaking engagements. It's the same model that TV networks have used for years; they create programming and give it away for free and then they get money from ad sponsors who want to reach their audience." At the "Purpose. Platform. Profits." event, Ratliffe and the other experts will teach attendees how to tap into what their true passion is, ways to monetize that passion, strategies to create instant capital and the specific steps they need to take to build a platform that will position them for high-level publicity opportunities and significant financial growth. Ratliffe and Neagle will provide live laser coaching for some attendees, and there will be a "Build Your List Soiree" and other networking opportunities. Marianne Williamson, author of many best-selling books, including "A Return to Love," "A Woman's Worth," and her latest "The Age of Miracles," has been inspiring people for years and will talk about the importance of staying true to yourself and your inner calling to achieve success. David Neagle has helped make many people millionaires through his private coaching and recorded programs. He will discuss the mindset you must have to achieve success and other principles from his Life Is Now and Art of Success programs. Gary Vaynerchuk will share his own story of creating Wine Library TV and building a multi-million dollar platform based on his passion for wine, and he will discuss the importance of building your personal brand. exposure to the right clients. Facebook to build your following and fame on a large scale. "With this new way of doing business, women can remain feminine while becoming wealthy, which is important because when women have to be in their masculine energy for too long it drains us of our sweetness, softness and creativity, which is the key to our success. I created the Purpose. Platform. Profits. event for all those women out there who may have seen the movie, 'Julie and Julia,' and are ready to really pursue what they love and to make money doing it," says Ratliffe, who is a Cordon Bleu-trained chef herself. There are several free informational teleseminars in which anyone can participate by phone between now and the event, including a special call with Gary Vaynerchuk on September 8 and two other free calls presented by Ratliffe on September 10 and 24. To register for the free teleseminars or for more information, visit www.estherexperience.com.